Walks around Es Castell and Mahon. The walk is not difficult although the pathways can be uneven and rocky in places. I have broken these walks up into a number of sections, all of which can be done individually, of you can do a circular route. There is only time and heat stopping you. Note, all these walks are easily done on a bicycle, except the cliff top route from Sol del Este to Es Castell. Note* Colours below denote coloured routes on the map. All these walks take you through the beautiful Menorca countryside, passing old fincas, farms with livestock and the rural scrubland with it's own wildlife. 1. Es Castell to the port of Mahon [Mao] along the cliffs, light Blue route. 1a. Back to Es Castell through the country, Red route. 2. Es Castell Poligono to Noria Riera and back to Es Castell, Yellow/orange route. 2a. Sol Del Este cliff top walk, Green route. 3. Cami de Cavalls, Cala Estaban/Es Steve to S'Algar purple route. 4. Mahon Calle Biniatap, Trebaluga, Mahon. Pale red, orange and dark red routes. Return by going up the slope onto the Mahon <-> Es Castell road, cross it and take the southerly road in front of you. After 150 metres turn left up the hill and follow the road back to the Es Castell poligono [1.15 Km]. Here again you have a choice, turn left and head back to Es Castell [0.75 Km]. 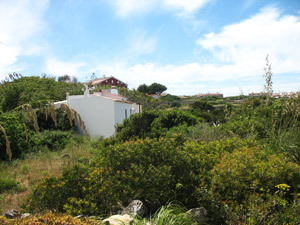 Starting at the roundabout on the main Mahon road head south past the Poligono and take the left turn at the end of the estate[0.75 Km]. Follow the tarmac road past the southern end of the Poligono for approximately 350 metres, then take the track to your right. After around a further 400 metres, just past large gates take another right fork. Follow the track through the countryside to Noria Riera [0.70 Km]. Onto the tarmac road and after 400 metres you join the main Mahon road. Here you have a choice, either turn left and head back to Es Castell [0.90 Km] Or cross over the road and return through Sol Del Este. An alternate route is shown by the yellow route on the map. 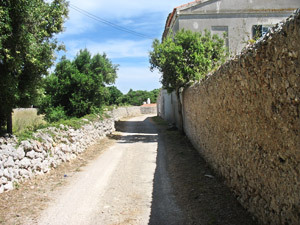 This takes you along one of Menorca's ancient narrow walled track-ways. Follow the road into Sol Del Este for approximately 600 metres and take the path through to the cliff edge at the side of the cafe. bar. Walk along heading north west, following the cliffs until you reach the bar above Cala Padera. Keeping right and down the steps stopping for a cooling swim, then up the other side and into Santa Anna. Take the road in front of you, follow to the end and turn right towards the car park above Cala Fonts [0.4 Km]. Down the steps and onto the wooden walkway which takes you into Cala Fonts. Alternate route is along the cliff edge around Santa Anna. Details of this section of the Cami de Cavalls can be found here. Route 4 Red, Orange and dark Red. As you enter the village keep right passing the Supermarket back onto the Sant Lluis road [0.2 Km], again cross the road and onto the dirt road in front of you. At the end of the road [3.2 Km] take the old menorcan walled path, 'Cami de Trepuca a Trebaluga' [0.63 Km] before it widens out into a dirt, then tarmac road. At the tarmac ked road junction go right and through the tiny hamlet of Xena and onto Trepuco [0.75 Km] Pass the T junction [left] and onto the next t junction [right] where you see the un-mistakable signpost [Mao <- -> Mao] Behind this is another narrow walled old path. Take this path, then turn right which leads to The Trepuco Talayotic site. Good walking shoes, sun hat, sun cream, a large bottle of water, picnic and a camera. The cliff top walk from Es Castell to Mahon. As you approach Cala Fonduco Mahon. Cala Fonduco Mahon, not many people get to see this tranquil place.